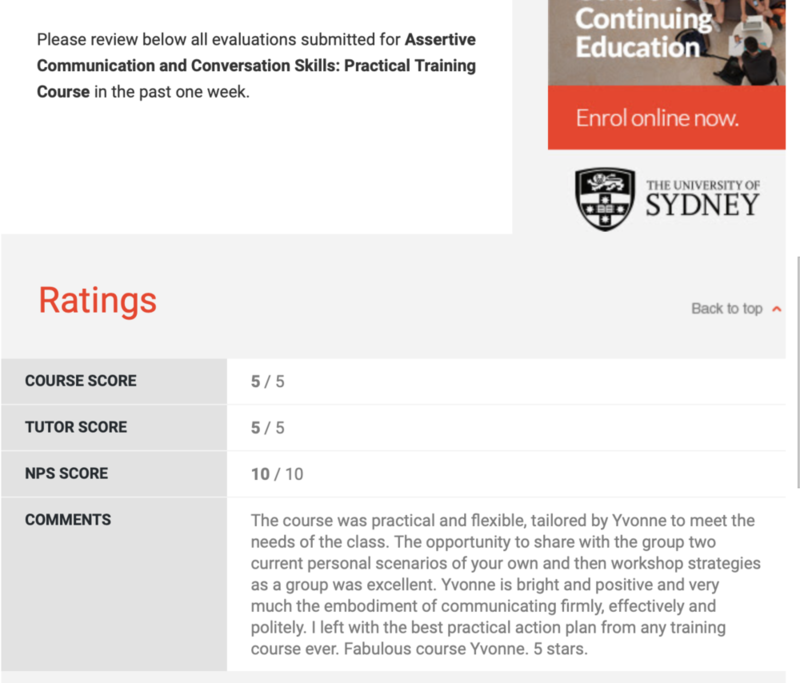 Yvonne is passionate about helping people become more assertive. Her definition of assertiveness is to balance Advocacy (the ability to speak up) and Empathy (to understand the feelings of self and others) under the umbrella of Respect. Yvonne helps people with timid behaviours gain the confidence to stand up and speak up, and those showing aggressive behaviours how to tone it down and develop more empathy. As well as coaching and in-house here are 4 public courses ( 2 Day, 1 Day 1/2 Day ) running many times in Sydney in 2018. A TWO DAY course 'Getting what you want: Assertive Communication Skills' with a week in between to practice. HALF DAY, 'Assertive Communication Skills' with North Sydney Chamber of Commerce. with Sydney University Centre for Continuing Education: 2 days with a week in between to practice. This is a practical course for people who want to learn how to say no, ask for a raise, make their presence felt in a meeting, or tell someone their behaviour is unsatisfactory (whilst keeping others onside). You will learn how to handle people who ignore you, interrupt you, unduly criticize you, make unreasonable requests, or vent their anger against you. Your life may never be the same again! 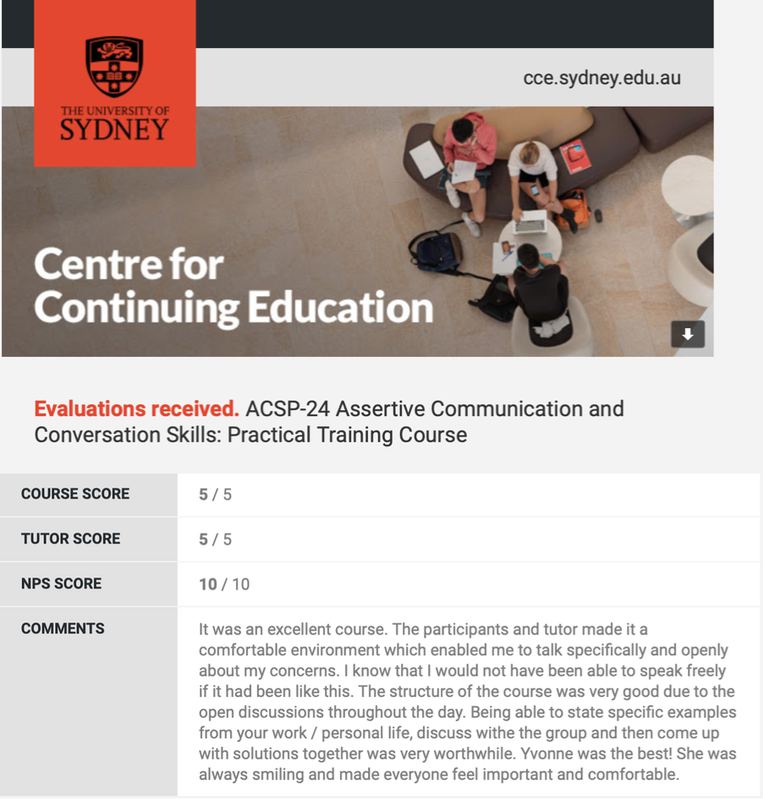 Yvonne designed and runs this course every term since 1997 for Sydney University Centre for Continuing Education. It is always evolving and leading edge, popular, fully subscribed and life changing. Anyone who would like to do the above with confidence and ease. "Excellent, vivacious. I particularly like the way Yvonne communicated with us as individuals, using our expertise and summarizing constantly what we've learned." "The course 'Getting What You Want' with Yvonne was a very effective mix of stories - worksheets - role plays - examples and so on. Expertly presented and taught." "I could never say NO to friend who was asking me for money. After day one of 'Getting What You Want' for the first time ever, I was able to say No. I feel so good, have money in my pocket and our relationship is much better now. Thank you so much." "Great presenter - good use of examples. Clear articulation and wonderfully enthusiastic." “Fantastic – explained well and targeted to all our needs.” "Outstanding." “I enrolled in Getting What You Want: Assertive Communication Skills at a time when I felt my life was in meltdown. I was on Workers Compensation because of workplace stress and had seen the course advertised. I requested that the course be part of my rehabilitation and return to work plan. My employer agreed and my personal and professional life has changed completely! People who work closely with me say that I have done a complete 360-degree turn around after only the first week of the course. I now deal with issues immediately they arise. I am positive and confident and I tackle tasks that I would have previously avoided such as confronting difficult staff about poor performance and unprofessional behaviour. When "challenges" come up I don't panic, I make a plan and use the skills I learnt in the course to get the outcome I want. I have learnt how to identify what it is I want. I have found my "voice" and for the first time in my life I am really happy. Yvonne, thank you so much. I also decided to take my new assertiveness into management of our household accounts and to my horror found that my tenant was many months is arrears in the rent. Once I got a grip of myself and made a decision not to panic I made a plan. I confronted her immediately and set up a meeting, she tried to delay by being late, but I persevered and was insistent that we meet that night. The outcome was that she paid me a month's rent immediately in cash and signed an agreement to pay the balance within a week! Yvonne will coach you 'one-on-one' to become more assertive, to say NO, to stand up for yourself, to get your message across and to get what you want. You have the tools and use assertive behaviour much of the time . . . but are there challenging situations when you feel uncomfortable, your buttons are pressed and your responses are inappropriate? In this Advanced Assertive Communication Skills one day interactive experiential workshop with Yvonne Collier CSP, you will gain practical ideas and leading edge techniques to give you positive flexible ways of enhancing your difficult / challenging communications and relationships, assertively. Communicate calmly and professionally, even in stressful and emotionally charged situations. Stand up and respectfully speak up and be heard in all situations, with anyone, anywhere, anytime. Learn how to emote, engage and empathize for greater influence, productivity and profitable relationships. Friday February 8, Thursday April 11, Thursday June 13, Friday July 26, Wednesday September 18, Friday October 18 & Friday November 21. Friday February 15, Thursday May 16, Thursday July 11, Friday 20 September, Wednesday November 13. This one-day Assertive Conversation Skills practical training course will give you the confidence, skills, tools and techniques to handle tough conversations with less stress and more success. You will learn and practise how to be assertive, conversationally without being forceful or defensive. Deal constructively with disagreement, criticism, conflict and bullies in a calm and professional manner. Set boundaries, push back, and become more influential and persuasive in your personal and workplace conversations. This experiential day enables you to work on your assertive language, your emotions, your mind and your physiology to courageously handle ‘difficult’ people and ‘difficult’ situations successfully. With North Sydney Chamber of Commerce TBA. "Following the course and revisiting after 3 weeks, I have made simple changes in my language and mind set, and am more confident in framing encounters in a way that the message is understood and acted on appropriately".